Hill and Wang, 9780809070169, 368pp. Mordecai is a brilliant multigenerational history at the forefront of a new way of exploring our past, one that follows the course of national events through the relationships that speak most immediately to us-between parent and child, sibling and sibling, husband and wife. In Emily Bingham's sure hands, this family of southern Jews becomes a remarkable window on the struggles all Americans were engaged in during the early years of the republic. Following Washington's victory at Yorktown, Jacob and Judy Mordecai settled in North Carolina. Here began a three generational effort to match ambitions to accomplishments. Against the national backdrop of the Great Awakenings, Nat Turner's revolt, the free-love experiments of the 1840s, and the devastation of the Civil War, we witness the efforts of each generation's members to define themselves as Jews, patriots, southerners, and most fundamentally, middle-class Americans. As with the nation's, their successes are often partial and painfully realized, cause for forging and rending the ties that bind child to parent, sister to brother, husband to wife. And through it all, the Mordecais wrote-letters, diaries, newspaper articles, books. Out of these rich archives, Bingham re-creates one family's first century in the United States and gives this nation's early history a uniquely personal face. Emily Bingham is the great-niece of Henrietta Bingham. She is the author of Mordecai: An Early American Family and co-editor of The Southern Agrarians and the New Deal: Essays After I'll Take My Stand. She earned a Ph.D. from University of North Carolina-Chapel Hill and frequently teaches at Centre College. She lives with her family in Louisville, Kentucky. “Emily Bingham's carefully researched, beautifully written and totally unforgettable saga throws light on never-before-revealed aspects of religion and life in the antebellum South. 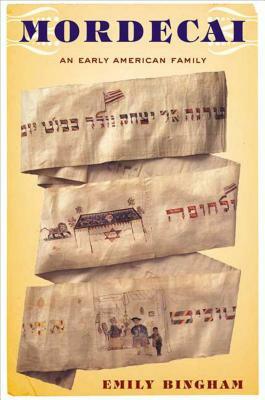 A remarkable tale of the making and the unmaking of an early American Jewish family.” —Jonathan D. Sarna, Joseph H. & Belle R. Braun Professor of American Jewish History, Brandeis University. “This account of a Jewish family in the Old South makes an original and illuminating contribution to our understanding of the formation of American nationhood--and marks the debut of a remarkably talented young historian” —Arthur M. Schlesinger, Jr.